There are a lot of MMORPGs out there. Three new major ones are coming out this summer Guild Wars 2, The Secret World, and TERA. They all claim to be very different from the MMORPGs that came before. I cannot tell you if that is true of the latter two, but with Guild Wars 2, it is very true. I’m a long time player of Guild Wars, and have written about it some on this blog. I wasn’t sure what to expect with GW2. I heard it was radically different from Guild Wars and it is. Except for the lore, the beautiful scenery, and the fact you are only limited to a few powers at a time, GW1 and GW2 have very little in common. There are too many differences to discuss, and other people have already. So I’ll just focus on my own experience. This beta weekend, they only had 3 of the 5 races to choose from. Humans (which is the only playable race in GW1), Narns (which are just taller and more tattooed versions of Humans), and Charr. Looking for something completely different, the first character I created was a Charr. The character creator part seems to be broken for the Charr, but I rolled a female Engineer. After a brief introductory cut scene, I was handed a pistol and thrown out on a mission with dozens of other players fighting off dozens of bad guys. No wandering around looking for NPCs to give you tutorials before you finally get to kill some lowly level one skale, like the first few minutes of GW1. In GW2, you are handed a weapon then thrown into a battle. The thing I least like about most MMORPGs is the repetitive button pushing: Push button 1 then 2 then 3 then 4, then back to 1 then 2 then 3 then 5 because 4 is still recharging, then heal yourself by pushing button 6, then repeat. GW1 has a lot less of that because once a bad guy is targeted, your character will continue to fire the weapon until the creature is dead, or until you stop it. You only push buttons for additional skills. GW2 does the same thing, only you push the 1 button instead of the space bar to fire (the space bar is now the jump button, there was no jumping in GW1). Not only that GW2 allows you to fight while moving. No more just standing there and firing like in some 19th century battlefield, you get to use guerrilla tactics, if you can figure out how. Also gone are the old “Go to NPC, get mission, run a long ways to mission, do it, run along ways back to NPC” time sinks. The mission giving NPCs are right where the mission takes place, and you get credit and rewarded upon completion immediately. But that is not all. As you travel from place to place, there are “event” missions randomly starting up around you. These have big rewards, involve a lot of players in the area, and are usually a lot of fun. 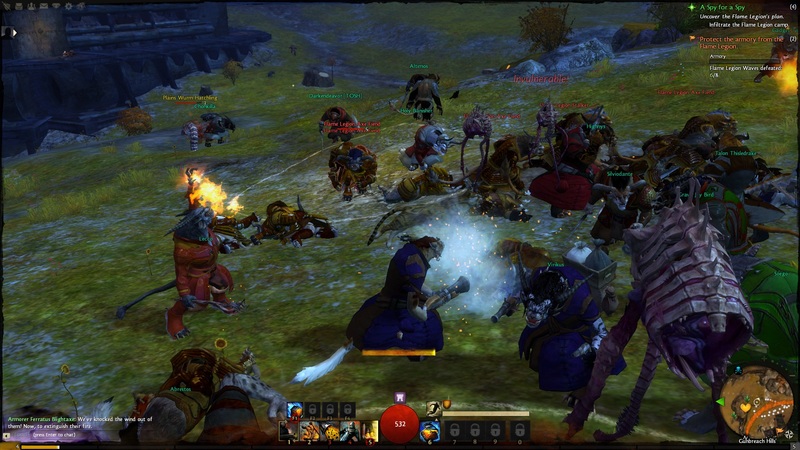 Even though GW2 is mostly played in an open environment, things like kill stealing and reward grabbing do not happen. Everyone who helps in a kill or a mission gets credit and is similarly rewarded. The level at which you play at also varies by where you are. I was doing a neglected low level mission, and noticed my hard earned 700 hit points were reduced to around 500. Because I was playing a level 3 mission, my character was lowered temporarily to a level 3 player. That might seem bad, but it means you play all missions at the level they were designed for and everyone in the area who is doing the same mission is on a level playing field. No more taking your level 20 Krytan character to Ascalon to do The Northern Wall mission designed for level 5 and having it feel way too easy. 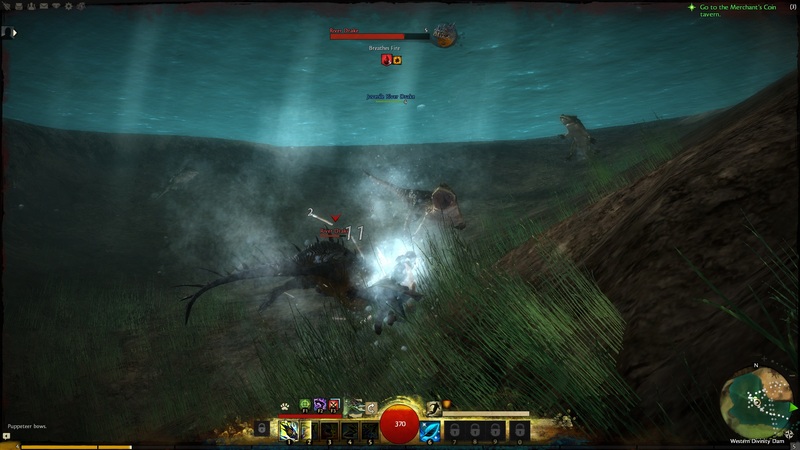 Underwater combat is fun, though this weekend did not have much of it. When the full game comes out there is supposed to be a whole continents of underwater content. When I discovered the underwater stuff, I was playing a ranger with a cat for a companion. The cat was not very happy with the underwater swimming, but I found an amphibious drake to train. When I’m above ground, I can use my trusty bow and cat companion. Underwater I have a harpoon and drake companion, and a breather so I can stay down as long as I don’t take too much damage. Probably the biggest change between GW1 and GW2 is character development. Like GW1, there are multiple professions, each with their own unique talents. In GW2, there are no secondary professions. Instead, character variation is done by choice of weapons. I always liked the longbow, which is a Ranger weapon. In GW1, any character could wield a longbow by taking ranger as a second profession, but they usually weren’t very good at it. In GW2, Warriors can use longbows natively, and they have a unique skill set when they do. I’m not a fan of melee combat, but now that I can build a Warrior with strong armor and give the Warrior a longbow (or a Rifle) and have it do ranged combat, well that is just awesome. A thief can act like an assassin with two daggers, or like Lara Croft with two pistols. However you want to play. Beta weekend is all about trying stuff out and enjoying the beautiful scenery. Knowing full well that any characters I create will just get erased after this weekend, I did not concentrate on building any up. I’d play the early levels, then roll a new character, trying all the professions and races. At the early levels, Ranger is the most fun, but I suspect that will change at the later levels. Engineers are kind of boring until they get turret access, light armored professions are a bit squishy. Death in GW2 still needs work. You can try to revive yourself, but if you succeed, you are often one shot killed rather quickly. Players can all revive each other, so if you do die where other players are, hopefully they will help you up. If you don’t want to wait, you can teleport to any wayport you have been to before, but that costs in game gold. Death penalty, like many other games, involves armor damage which costs game gold to repair (and if you don’t repair it, eventually your character will start running around in their underwear). In other words, dying will cost you. The death penalty in GW1 was a reduction in max health and energy that went away at the next village you went to. 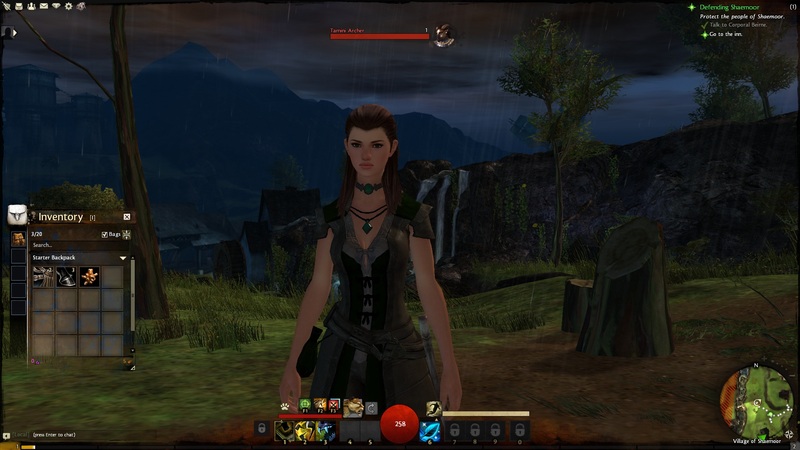 I kind of like the GW1 version better, but it will not work in GW2 because towns do not work the same way. Beta bugs aside, Guild Wars 2 is an awesome new MMORPG that is perfect for the MMORPG fan who is tired of the same recycled D&D/WoW model of game play. Looking forward to the full release.